This is a a spectacular 39×47.5mm. 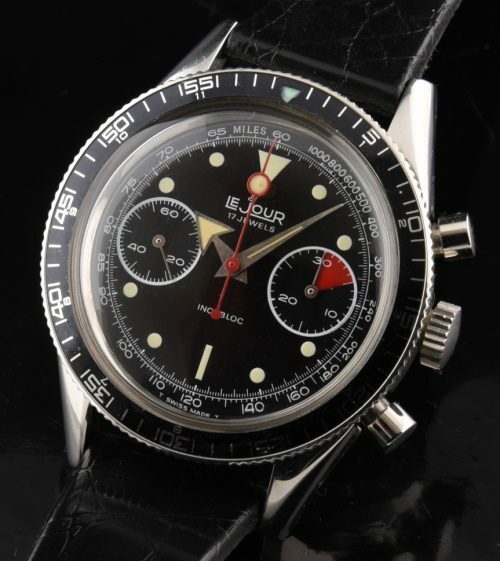 1960’s vintage Le Jour chronograph with a crisp original dial and hands. The original bezel is also amazingly clean. The fine Valjoux 7733 chronograph movement was just cleaned and is accurate, with all functions operating smoothly and signed correctly, J. P. Pingouin. These exotically dialed watches in fine original condition are extremely hard to find these days and I expect their prices to rise. I would jump on this one fast.